Pesto is quick to make and perfectly storable for some weeks. So you will get quickly a great dish for many meals to come and you can store fresh herbs. This dish bursting of freshness is not only great as a quickly to prepare dish for lunch or dinner – we cherish Pestos as little gifts, like delicious ramsons pesto with ramsons-pesto labels or the likewise green and very savoury parsley pesto – where we are going to provide parsley pesto labels to print out right here. 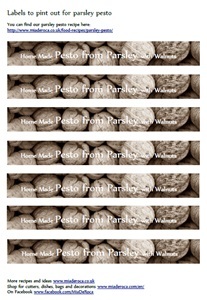 The parsley pesto labels are perfect to stick as banderole straight over the jar lid. You can as well use them like normal jam jar labels and glue them across the jar. The labels are narrow and elongate - white letters on a photograph with walnuts, image reduced to brown shades. 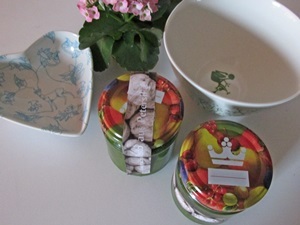 Exceptionally practical and handy become these labels if you are storing several pesto jars in your fridge. 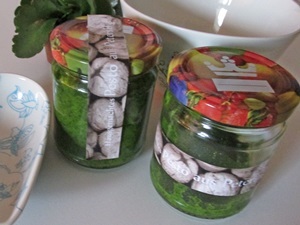 With the pretty stickers you know at first sight which one is the wild garlic pesto, pesto verde, stinging nettle pesto, parsley pesto, wild herb pesto, salsa verde or even gruene sosse. For those who are looking for inspirations and ideas to make their little culinary gift look even better: Here you get tips how to decorate jam jars and pesto glasses. On the fly you have created low priced and lovingly decorated gifts, you can use when invited to gift to your hosts, or as favours for weddings, birthday parties and other celebrations.